Workforce analytics is a very significant development in human resources. It promises the potential for deeper understanding of the ways workers contribute to organizational performance. However, workforce analytics is not just about analyzing data to reveal exciting insights; it also requires the active involvement of a firm’s workers if the potential of analytics is to be fully realized. Without active employee participation, workforce analytics efforts face at best, restricted data sources and data sets that are incomplete and at worst, the risk of damaging employee relations and, ultimately, productivity. 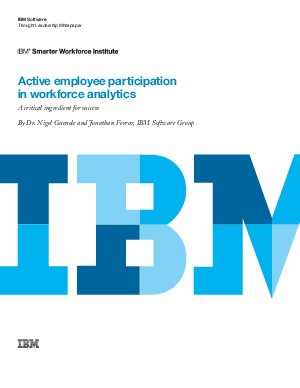 This white paper summarizes recommendations that will encourage enthusiasm for workforce analytics and active employee participation, using the FORT (Feedback, Opt-in, Reciprocal, Transparent) framework.